Happiness! is what we all are in search of everyday and every moment. To be contented is a challenge for all of us. With a good recommendation from my senior colleague and also from a friend, I started reading the book – Flow: The psychology of optimal experience by Mihaly Csikszentmihalyi (Pronounced: “cheek-sent-me-high-ee”). Well, I should say, this is the best book I have ever read on Psychology. Not just because it gave me deeper insights, but also, it kept me in flow throughout my read. I would like to read this book again after 6 months. I took a bit longer time in reading the book because it requires a lot of patience, understanding and great deal of thinking while you read. As Mihaly says early in the introductory chapter, to understand this book completely, one requires a lot of patience. After all, he has written it so well that all the readers will be in the state of flow for sure. 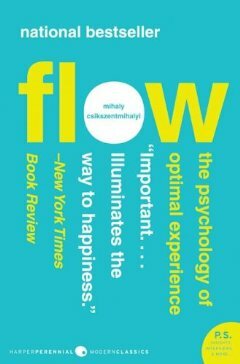 Flow is a concept created by Mihaly Csikszentmihalyi, a professor of psychology at the University of Chicago. The author has been extensively working on this concept since 30+ years. Flow is a state of mind of involved enchantment that lies between boredom and anxiety. It is the joy, creativity and the process of total involvement with life. While I was reading this book, I even made a lot of notes on good number of interesting concepts. One can read them here. I enjoyed reading every page and every chapter. The book starts with a saying from Aristotle that ‘every person, more than anything else, they seek happiness’. Beating the phenomenon that reflects the irony in pursuit of happiness, many people make their mind unexciting and suppress its search for meaning. In doing so, people give up those activities that gives them the deep satisfaction. In the book, there are stories of lot many people those were studied and interviewed on all the aspects. Each example opens up a new realm of possibility. We have always experienced joy and freedom in pursuing our hobbies; we have seen how musicians lose themselves in their tunes, how a painter becomes a painting herself; and how a poet enjoys playing with his words. Even I used to ask myself some questions like: why am I enjoying what I am doing right now? Why is it that I find that particular job not challenging and hence not exciting? Why is it that people tend to do the activity that keeps them happy? What exactly is the satisfaction in doing any activity? Why are people attracted to new challenges? Why do people go on trekking? Why do I like taking a long vacation for my hiking trips? The answer for all the questions raised above is Flow. 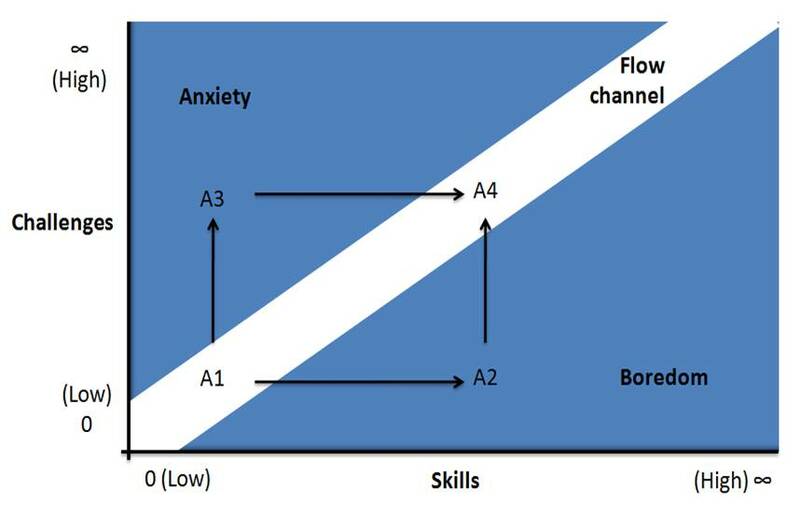 A person in flow is mentally involved in the challenge and intrinsic pleasure of the activity, yet lacks self-consciousness and fear about performance. There are many stories of rock climbers, artists and musicians given as examples in the book that speaks about their state of mind. When exactly a person will be in flow? What exactly happens when a person is in flow? How can he or she enjoy so much in that state? Flow involves a lot of energy and effort. The challenges one keep taking and the skills that requires pursuing the goal creates the path for the flow. As long as I am learning and growing in any activity, I am in full control and hence in flow. In the above figure, as I mentioned earlier, flow is a state where a person involves both Skills and Challenges. Here A1 and A4 are the states of a person in flow. A1 is still at the start where person is yet to take up a new challenge and yet to train himself on the required skill; A4 is at the much higher state of flow. A2 is a state of mind where person takes no challenges in spite of having skills and hence end up in boredom. And A3 is a state of mind where a person never trains himself on the required skill sets in spite of taking lot of challenges and hence ends up being anxious. Hence A2 and A3 do not qualify under the flow condition. As I understand this figure well, I am getting more clarity on answers to my entire questions. Every activity will follow the states mentioned in the above figure. I believe contentment is certainly a hard work and to achieve that, one has to control their consciousness. When a person is able to control his or her consciousness, they can succeed in achieving their goal without any distractions from the internal or the external factors. The chapters Happiness Revisited, Enjoyment and Quality of life, the flow of thought, the body in flow, Enjoying solitude and other people, and finally the making of the meaning are an absolute pleasure to read. I was in flow and I learnt a great deal. The author has covered every aspect of one’s life that can contribute to the state of flow and hence to pursue their happiness. The author says, “Flow doesn't require education, income, high intelligence, good health or a spouse. It requires a mind: one that is willing to set challenges for itself and make the effort to meet them”. The book ends with the chapter on making of meaning which gives a lot of insights on how to set a life theme that is in flow. It was magical to read and very truthful to believe. I strongly recommend this book to everyone. Having read this book, my mind is revolving around the concept of flow. Everything that I see, every activity that I do, I know what exactly I need to look for to keep myself reach the optimal experience. And those hiking trips that I take are now even more exciting to think and plan! It is better late than never; the book was first published in 1990. There are a lot of books on the concept of flow itself. The book Creativity by the same author is my next read. Was trying to remotely connect the "flow" to what Malcolm Gladwell calls "Fluidity" in his latest book. Definitely i like to be carried away in the flow!!! Thanks. Thanks for suggesting such a good book! Looks very interesting. The concept of Flow explained in the review is simple, yet complex to understand and follow by many. It is said that people who are doing what they like to do never go to heaven because they have already been in one. Regrettably, most of us have to do things that we may not like to do in order to survive. Often, making a living means meeting society's needs and not our personal needs. Occasionally, our needs and society's needs converge and we experience the thrill of self-fulfillment. Pace, Aristotle. I am not convinced that happiness is the goal of life. I prefer the stance of Immanuel Kant, arguably the greatest philosopher, that the object of life is not happiness but to lead a life that is worthy of happiness. Great review of a good book.